Concordia University – St. Paul is a university in Minnesota that usually goes by the name of Concordia University. The St. Paul used in the name distinguishes it from other college campuses of the same name. Established in 1893 by the Lutheran Church-Missouri Synod, it originally served as a prep school that prepared high school students who wanted to do missionary work with the church. The school then purchased the campus of a former state training academy and used it as its first main campus. As the school grew, it added more high school classes and then introduced some college courses. This led to it becoming a two-year junior college and gaining accreditation in the 1920s. Many of its early students attended both high school and college on its campus. It wasn’t until the end of World War II that the college began offering four-year degree programs to take advantage of the soldier returning from overseas who had access to the GI Bill. 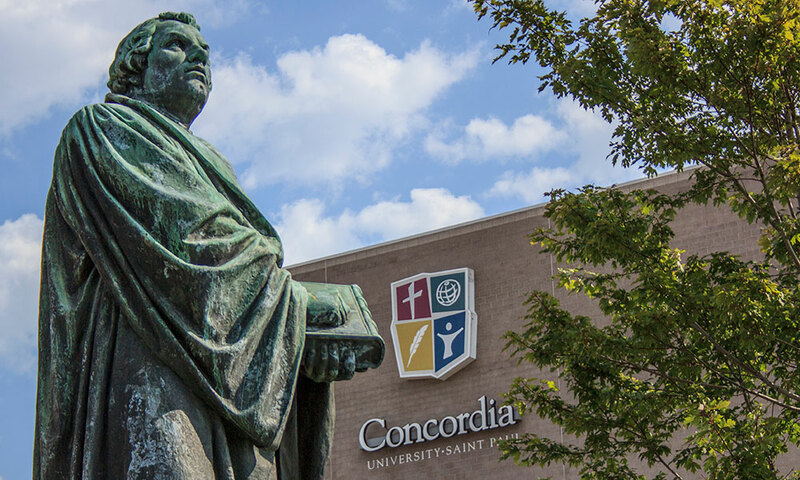 Concordia is now a full university that retains its religious affiliation and offers a number of opportunities for students like a variety of sports teams that they can join. The campus is also home to dozens of clubs and other activities for students majoring in any subject. It has an enrollment rate of more than 4,000 students, which includes some graduate students and doctoral students enrolled in upper division programs. Concordia first gained accreditation back in 1967, which was when it still operated as a college. Since becoming a university, it continued getting accreditation from the High Learning Commission. The Accreditation Council for Business Schools and Programs accredits all its business programs at all levels, and the National Council on Family Relations granted accreditation to its family life education programs. As an education major, you’ll find that the university received accreditation from the National Council for Accreditation of Teacher Education. Its education programs also have approval from the Minnesota Board of Teaching. The university has four requirements for students who want to enroll in one of its graduate programs. You’ll first need to fill out the university’s online application. This application requires that you create your own account, which will let you log in and out as needed. You can set up a reminder to help you remember your password in the future too. It asks you questions about any colleges that you attended, whether you have any professional experience and what you want to study. After finishing your application, you need to complete a financial aid form. This allows you to tell the university that you will pay your tuition on your own or whether you need financial aid. Concordia will tell you more about the payment plans and pay as you go options to help you decide which one is best for you. You’ll then need to send the university an official transcript from your college. This transcript must list the date your earned or the estimated date that you will complete your bachelor’s degree. There is also a goals statement requirement. The university asks that you submit a list of academic goals as well as career goals that you have for the future. This goals statement must be at least one page long but no longer than two pages. Each Concordia graduate degree program charges a different tuition rate based on the number of credit hours of classes that you take each semester. Most of the Master of Arts programs in education available through the university charge $440 per credit hour. Other education graduate programs charge between $395 and $475 per credit hour. In addition to tuition, you’ll also need to pay your own living expenses, for transportation to the campus and for your books and any other supplies. Concordia offers a pay as you go option for graduate students paying out of their own pockets. You pay only for the classes that you take in a semester and can take time off whenever you need. The university also accepts the GI Bill and other financial aid programs designed for military students. If you think that you need help paying for graduate school, you should use the FAFSA. Students who are older or meet other requirements can file as an independent and get financial aid based on their incomes, but those who are dependents will need to use their parents’ incomes. Concordia will base your financial aid package on your total cost minus your or your family’s contribution. The university will also accept Stafford loans from the federal government and alternative student loans and can even help you find more information about those alternative loans. Concordia University-St. Paul offers three different education programs at the master’s level with a concentration in special education. The first has a concentration in emotional and behavioral disorders. Designed for those who want to work with students diagnosed with those disorders, this program helps you get your EBD license. You’ll need to take 36 credits of classes that include behavior management, collaborative teaching in inclusive settings, applied experience in emotional behavior disorders and interventions for students with emotional and behavioral disorders. A separate program is available for students who want to get a license without earning a graduate degree. The university also offers an Master of Arts program with a concentration in autism spectrum disorders that awards students an ASD license. This program is a little longer than the last and includes 39 credits of classes such as ethical issues for professional educators, teaching students with linguistic differences or difficulties, conducting research and completing the capstone and communication and social skills training. Another option available from this university is an Master of Arts in Education with a concentration in specific learning disabilities. This program awards graduates an SLD certificate that shows they can handle working with children who have difficulties learning. The courses in this program go over the ethical issues you might face in the field, different ways of assessing your students and strategies that you can use to educate those students. Concordia University-St. Paul offers all these programs as Master of Arts programs and as license programs.